click here for larger view Jolly Jester is a Microgaming Slot Game Release. Although you can wager from 1¢ all the way up to 20¢ and up to 5 coins on any of the 25 paylines it's the Jolly Jester Bonus Round Featue makes Jolly Jester worth playing. First the Jolly Jester character is the wild symbol and substitutes for all other symbols except for the Castle scatters. Two Jolly Jesters pays ten and two Castles scatters doubles your win while three or more stopping on any of the 5 reels triggers the Jolly Jester bonus round. You even get a small win for just two of the King & Queen symbol or Mandolin symbols. Three juggle balls or shoes awards a win of twenty-five. The other reel symbols are grouped in pairs of two and pay the same for any three that stop on a covered payline. The 9 and 10 symbol award five, Jack and Queen award ten and the King and Ace award fifteen. When three or more Castle Scatters trigger the Jolly Jester Bonus Round you enter the courtyard. In the courtyard are nine boxes. Behind each box is either a Free Spins symbol, a Jester wild symbol or a Castle scatter. You pick a box one at time to reveal which of 3 possible bonus rounds you'll get. Match three Free Spins you're awarded 10 free spins at an increasing multiplier. The first spin multiplies any winning combinations by 1, the second free spin multiplies any winning combinations by 2, the third free spin multiplies any winning combinations by 3 and so on all the way up until the 10th free spin which multiplies any wins by 10. Reveal 3 Jester wild symbols and you're awarded 10 free spins with the King & Queen symbol acting as another substitute wild. Plus all wins are automatically doubled. Reveal 3 Castle Scatters and you're awarded 10 free spins but this time the King&Queen symbol becomes an additional scatter symbol and all wins are doubled. 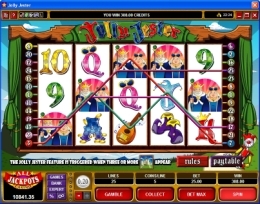 Jolly Jester has a Gamble feature where you can bet your payline win for either double or quadruple the amount. When you see the Coins button change to the Gamble button you can play. Click it to enter the Gamble screen. Either pick the correct color, red or black to win double or pick the correct suit to win quadruple. Top prize in Jolly Jester is 10,000 coins betting 1 coin or 50,000 coins betting max. Check out the Winning at the Slots Recommended Online Casino Brands or go straight to our Quick Downloads and install casino games from all the leading brands!